Today I had a hard time getting out of bed. Today I stopped at our local coffee shop for a latte on my way into Beaverton. Today I stood at the counter looking at the cookies Anna loved and I cried. Today the girl at the counter placed a Love Rock for me on top of the cookie case. Today I shared Anna and Abigail’s love story and Love Rocks with a 5th grade class at Jacob Wismer Elementary School. Today I got to tell a classroom of children about how Anna loved riding horses and climbing and how Abigail loved to be on stage. Today I showed a room full of children how to cut a heart on the fold small enough to fit on a small rock. Today, at the end of my time at the school, a boy gave me a Love Rock made with my favorite fabric ~ he had overheard me tell another classmate that the fabric she was using was my favorite. Today I stopped for another latte and ran into a pastor from my church. Today I spent some time sharing with him about how God holds us in our sorrow. Today I got home from my outing and opened the most beautiful card from the 5th grade teacher at Jabob Wismer Elementary. Today I realized that on this day, that girl behind the counter, those children, that teacher, my pastor were all placed in my path as a way for me to see how beautiful His love, His guidance and His glory is. Today, like every second of every other day, I miss my girls. Today I got out of bed and I felt Love! 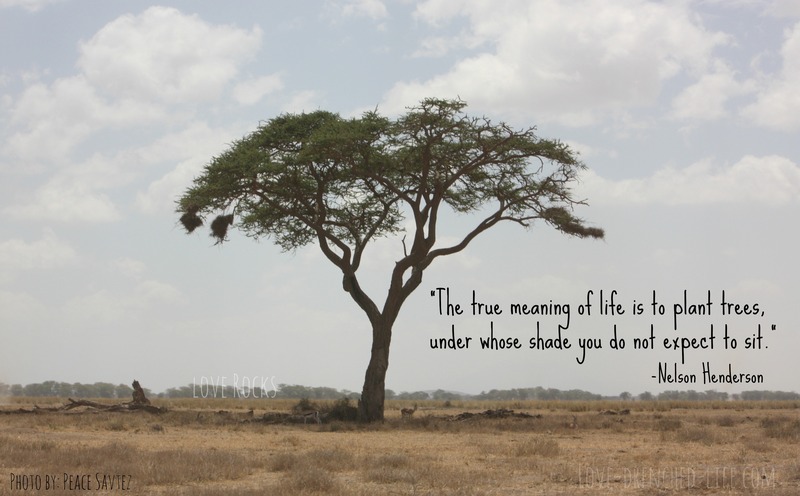 This quote was written in the card from the 5th grade teacher and the tree was one we saw when we were in Africa. Update~ Last week I wrote about my high school classmate and how he was waiting for a lung transplant. Yesterday he received a beautiful set of lungs. I am continuing to pray for everyone involved. love you Susan, thank you for sharing this and inspiring me to share love even in “small” ways today. Sometimes life is just taking one step, hoping that the next will hold you up. I love you Susan. I’m glad you got out of bed, and experienced so many big and little blessings today. It’s a reminder for all of us to get out there, make connections with others, and notice the countless blessings that are there each and every day…just waiting for us to open our eyes and our hearts enough to see them. I love this quote – You are such a beautiful person Susan with an endless amount of love to share! Thank you for sharing part of your morning with us. You were as much a blessing to those students today as they were to you. I’m so happy you came across such angels on earth to help you through your day. I’m pretty sure your girls were there to help you along and help you keep on going! I love you Susan and will send you prayers for continued strength on your journey.